Timely calling has often proven to be the deciding factor between not seeing deer and tagging the trophy of a lifetime. The stars were shimmering on a clear mid-November morning when Brad Harris climbed into his treestand on a wooded hilltop. He spotted a few does at daylight, but no bucks. He made a series of six grunts with a mouth call, followed by a sequence with a rattle box, and ended with a few more grunts. No response. About 30 minutes later, Harris repeated the grunt-rattle sequence. Still, no takers. At about 7:40 a.m., he went through the gambit a third time and immediately heard a deer running in his direction. The buck stopped 60 yards off, paused for a few seconds, and trotted within 20 yards of Harris, who promptly arrowed it. The typical 10-point scored 176. Harris casts three loud doe bleats or grunts. He sends the sound in all directions by emitting one grunt or bleat to his left, another in front of him, and the third to the right. Hale says he never calls blind when he hunts a specific trophy buck because he believes it may send the buck in the opposite direction or give away his position. Another downside is that other deer may respond to the calling first and bust him, which would surely put off a big buck. 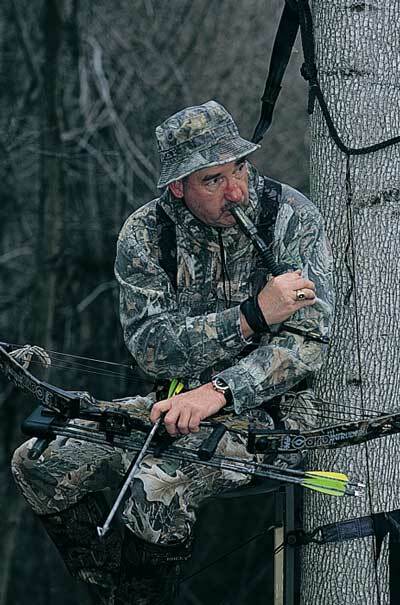 When calling a buck that is in sight but out of range, respond to the buck’s reactions. That’s what Keith Burgess did while bowhunting Mississippi’s rifle season in late November, early rut in that part of the South. Burgess was hunting in fairly open woods and saw a dandy 8-point buck about 100 yards away. He wanted to bring the buck closer for a sure shot, so he called with doe bleats. The buck started toward him, but then hung-up behind thick cover. Harris pointed out that one of the more common mistakes made by hunters is to stop calling once you get a buck’s attention for fear the animal will spot you. When he sees a buck moving out of range, he emits a single, soft grunt or bleat, which he calls a contact call. If the buck gives no indication it heard anything, Harris calls louder, using as much volume as necessary to stop the buck.